After indulging in a watery relaxation zone at the Baltic Beach Hotel called The Garden, you’ll emerge feeling like a new human. Stroll into the lobby of the Baltic Beach Hotel and a feeling of opulence washes over you. But the five-star property overlooking the 30-kilometer strip of sand in the resort of Jurmala, a short hop from Riga, is anything but stuffy. Staff and guests chat casually about the weather as if they’re old friends, and it’s not unusual to see people wandering about in robes and slippers. 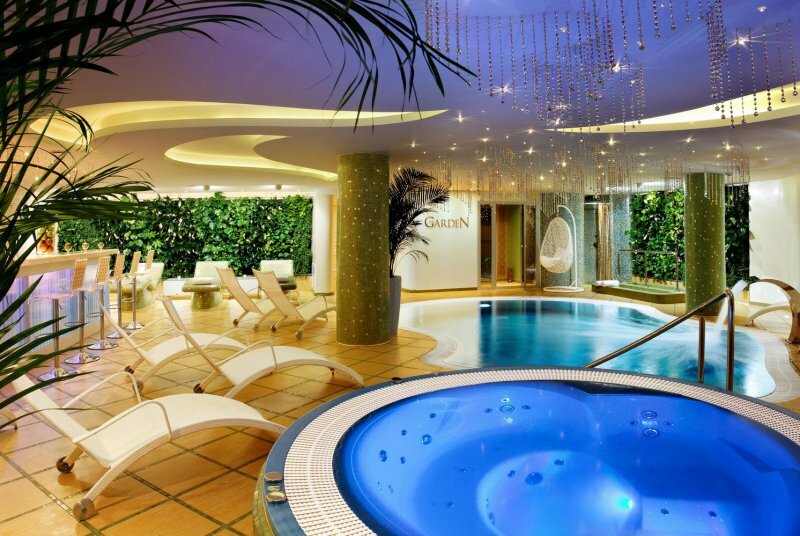 The 165-room hotel prides itself on its spa facilities, the newest and most impressive of which is a watery relaxation zone called The Garden. We went to explore this sparkling, spotlessly clean retreat with its curved walls and tropical plants and report back to you. Essentially, The Garden bundles together a number of saunas, a hammam Turkish bath and an oriental-style rasul set around a pool and Jacuzzi. It’s possible to do a circuit at a relaxing pace in about 60 to 90 minutes, but lengthy spells on one of the hot stone beds can stretch a visit comfortably to a couple of hours. A “phytobar” serves up elixirs, juices, smoothies, teas and cucumber water. Amazingly, when we entered at mid-afternoon on a weekday it was deserted except for two uniformed female assistants. This made the experience all the more memorable for us, but if you’re a social creature The Garden attracts more customers in the evenings and at weekends. Change into your swimwear, a white robe and non-slip flipflops, depositing your clothes in one of the smart wooden lockers, and emerge from the changing rooms. 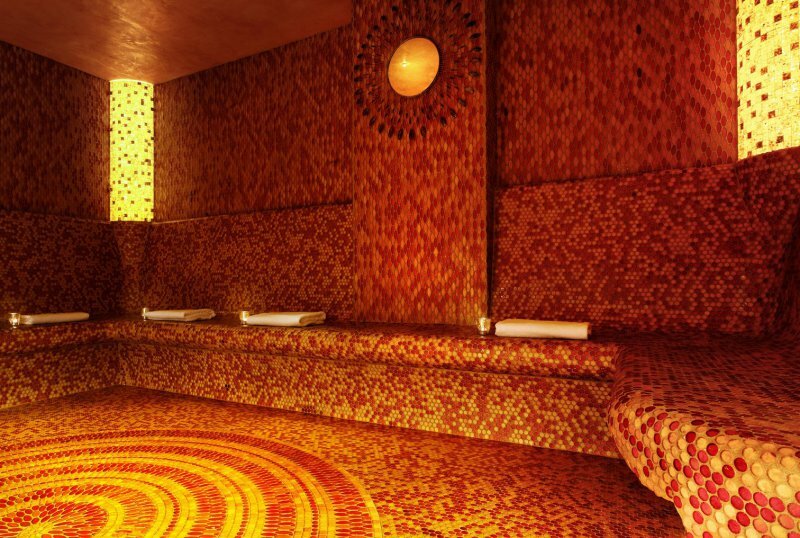 First up is the Amber Bath, a subtle but warming sauna with citrus infused steam and three columns made of natural amber. Intricate orange-and-yellow mosaics take the form of the sun, and with its comparatively low humidity it seems to emit the sun’s energy. Next try the pleasure shower. A choice of three settings shoots out water at contrasting temperatures, designed to surprise as well as ease stress. “Tropical rain” is cooling with the sound of thunder; “shower fun” starts out shiveringly cold before heating up; but best of all is “Mediterranean rain” with its warming water and bird calls. 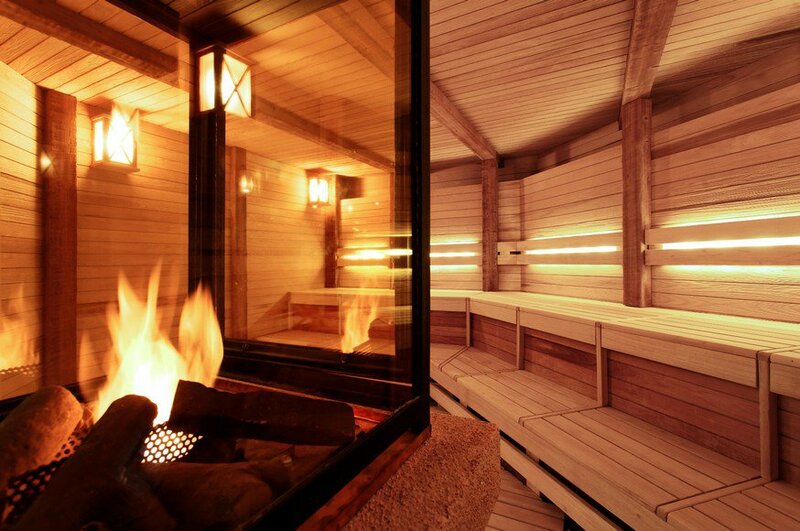 After that came our favorite of saunas – a beautifully scented aspen dry sauna set at 85 degrees with a row of flames burning behind glass. Close your eyes and meditate to the shadows of the flickering fire on your eyelids. Contemplate things like: how do the flames keep burning so steadily, or: is fire’s ability to calm and mesmerize a vestige of our subconscious ancestral heritage, or: how much would it cost to have a sauna like this at home? To cool down, now might be the time to take to the pool. It’s long enough only for a backstroke or two, but the dip is refreshing as you float staring upwards at strings of crystals twinkling among tiny star-like lights. A magnificent octagon-shaped onyx slab dominates the dark hammam. A wooden pail full of “soap cocktail” has been prepared for you to lather over yourself with a peeling glove. Lie on the slab for further contemplation, thinking: where does all our dead skin go, or: is it possible to ask someone to soap me, or: can I fall asleep like this? Take care as you slide your slippery body off, and wash away the bubbles by filling an elegant copper urn with water and pouring it all over yourself. Finally it’s time for the rasul, or rhassoul as it’s also known. This also requires self-smothering, unless you’re with someone who can assist, as you’re given a small bowl of mineral-rich alpine clay. Take one of four seats and when waters start to burble over the clay rub it over your body. What happens next is magical, as the skies – a dome portraying the stars overhead – open up and a luscious, thickly humid, herb-infused steam gently washes the clay away. We emerged from The Garden feeling calmed and refreshed, rid of dead cells and negative energy, spirits regained and motivation restored. At least for now.